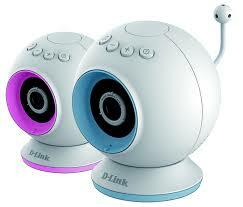 Can I use the D-Link DCS-825L camera when there is no Wireless router available? Yes, you can bring your camera and connect directly to the camera’s wireless signal when you are on the move or at a friend’s house – no need for a separate wireless network/ router. Note: When connecting directly to the camera’s wireless connection (not the router) for monitoring, your mobile device will not have access to the Internet using this WiFi connection. Internet acces can only be set up using your router’s or AP wireless network. 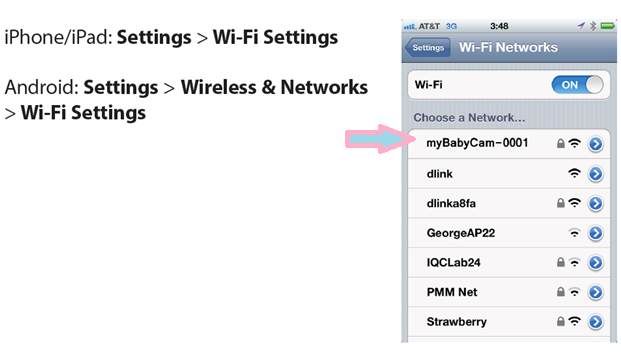 Connect your mobile device to the “myBabyCam-xxxx” Wi-Fi network where XXXX is a 4-digit code (the last 4 digits of your camera’s MAC address). The Wi-Fi password is printed on the label at the bottom of the camera and on the back of the QIG. 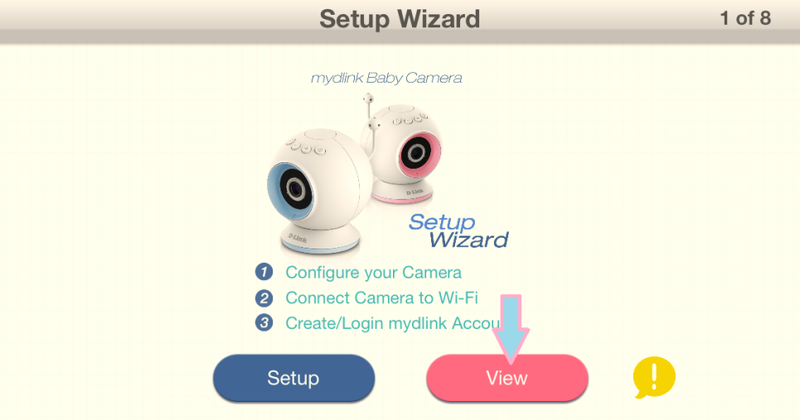 Open the mydlink Baby Camera app and tap the ‘Reconnect’ button for the camera or tap the “View” button on the start screen. 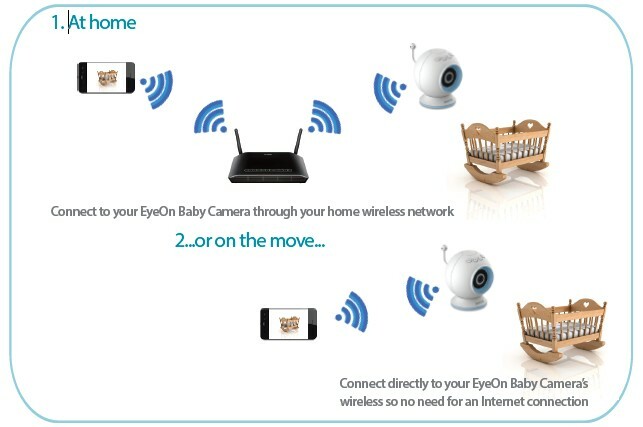 Enjoy connecting to your wireless Baby Camera directly using your iOS or Android compatible mobile device. If you are new to parenting or are on your second or third child, then you know baby monitors have long been a mainstay letting you know when your child has woke from a nap. Traditionally, baby monitors have been an audio-only solution, but today we will take a look at D-Link’s twist on the technology in the form of the D-Link DCS-825L Wi-Fi Baby Camera. This newly released camera from D-Link builds off their great knowledge in building network surveillance solutions such as the 2330L and 2332L we have reviewed previously. This time around, D-Link designed the solution from the ground up to take advantage of features like a room temperature monitor, motion sensing, and a built-in speaker that can play lullabies. In addition to those features, D-Link has integrated a 720p capable image sensor along with night vision capabilities and an onboard microSD slot for recording H.264 video. Pricing of the D-Link DCS-825L at this time is set at $179.99, with a one-year warranty. Availability is quite high with several retailer carrying stock. 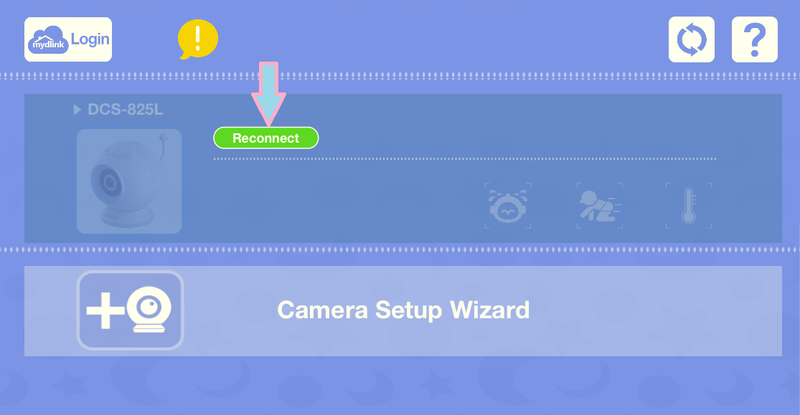 During the initial steps with the Setup Wizard, you configured the camera to connect to your home Wi-Fi network. If you want to take your camera with you when you are traveling, it’s not a problem with the D-Link DCS-825L. You can connect directly to your camera, which means there is no need for an Internet connection or a router. Follow the steps below to enable direct connect. 1.Press and hold the (+) button on the camera DCS-825L for at least five seconds.The temperature indicator LED on the top of the camera will flash three times. 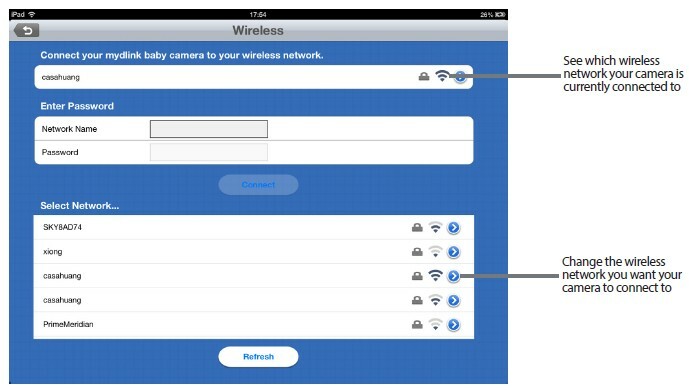 2.Connect your mobile device to the myBabyCam-xxxx Wi-Fi network. (XXXX is a 4-digit code, the last 4 digits of your camera’s MAC address. )The Wi-Fi password is printed on the label located on the bottom of the camera. 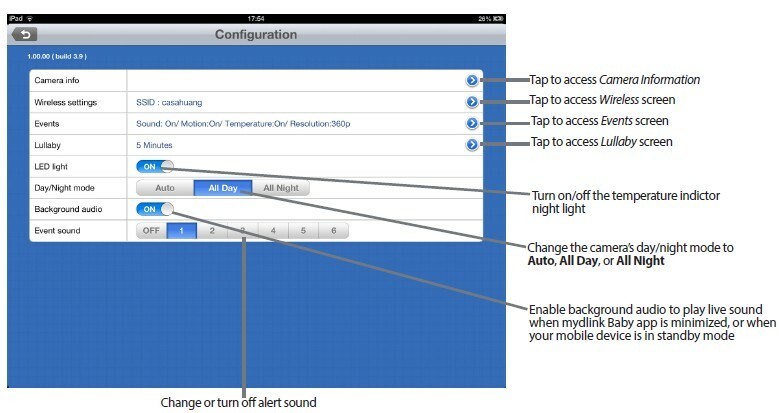 3.Open the mydlink Baby Camera app. 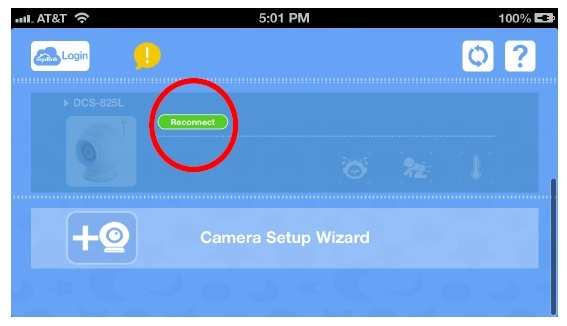 To connect, tap the Reconnect button for the camera. 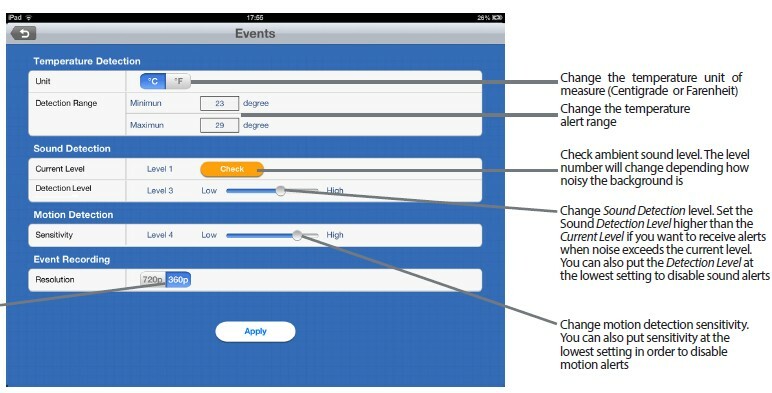 Note: For an additional mobile device, download the mydlink Baby app on the device and launch the app. You will see the Setup Wizard screen. Tap View. Enter the camera password that was created during the initial setup. 4.To switch back to connecting the D-Link DCS-825L with your home Wi-Fi network, press the (-) button on the camera for at least five seconds. 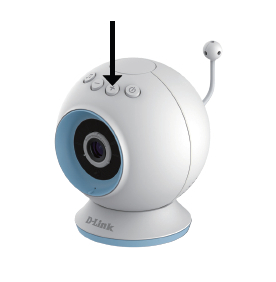 Keep an eye on your little one with the EyeOn™ Baby Camera D-Link DCS-825L. This portable camera transforms your mobile device into a versatile, yet easy to use baby monitor. Connect to the camera wirelessly at home or through the Internet when you are at work, so you can check on your infant no matter where you are. It’s packed with features to help you care for your child, including motion, sound, and temperature monitoring, as well as night vision, automatic snapshots and recording. 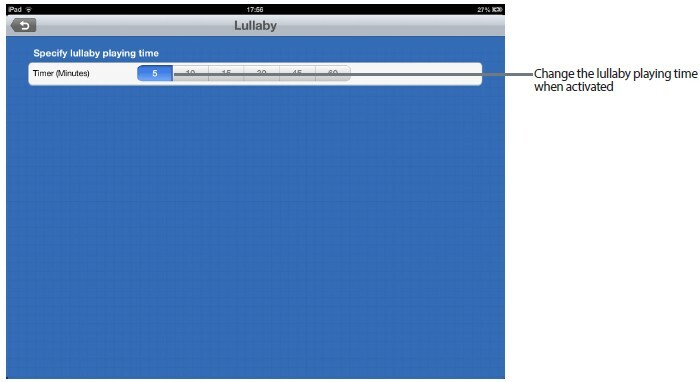 It can even play gentle lullabies to help ease your baby to sleep! The EyeOn Baby Camera has been designed to meet the highest safety standards. However, please make sure that it is set up and used correctly. Below are important safety guidelines you should follow. children. Keep any attached cords out of your baby’s crib/cot. Make sure the EyeOn Baby Camera and cord are out of baby’s reach. In general, this means the EyeOn Baby Camera and cord should be placed at least 3 feet away from baby’s crib. Watch for other cord hazards, too. While you’re securing the EyeOn Baby Camera cord, take a moment to look around for any other strangulation hazards, as well. One common culprit is window blind cords that are within baby’s reach. Cords for other electronics and nursery decor with ribbons or decorative cords may also be a risk. the rail could be yanked or twisted by a curious child. Use caution if using the wall-mounting for the EyeOn Baby Camera. Be careful not to allow the EyeOn Baby Camera cord to dangle between the cot and a wall. You should use the 3 foot minimum spacing between baby and the cord in this case, too. Mounting the EyeOn Baby Camera on table tops. Place the EyeOn Baby Camera on a table top no less than 3 feet away from your baby’s crib. Feed the power cord down the back of the table or use wall clips to secure the cord away so your baby cannot reach the cord. Plug in the power cord, check your smartphone or tablet to ensure that you are getting a good view of your child and that there are no obstructions. As your baby reaches toddlerhood, re-evaluate the EyeOn Baby Camera placement. When little arms get longer and toddlers learn to climb and reach for things, you may need to move the EyeOn Baby Camera to prevent access to the cord. When using the EyeOn Baby Camera in other places, such as outside.Don’t forget to check those locations to be sure you can place the EyeOn Baby Camera out of baby’s reach. Do not use the EyeOn Baby Camera near water. Do not use the EyeOn Baby Camera near water (such as bathtub, sink, etc.) and safely keep the baby camera away from heat sources (such as stoves, radiators, etc.). Make sure there is proper ventilation. 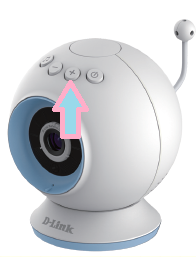 Make sure there is proper ventilation around the EyeOn Baby Camera and do not place on sofas, cushions, beds, etc. which may block ventilation. The EyeOn Baby Camera is not a toy. The EyeOn Baby Camera is not a toy. Do not allow children to play with the camera and do not attempt to disassemble. The EyeOn Baby Camera is not a babysitter. The EyeOn Baby Camera should only be used as a parenting aid for monitoring your baby or child.Whilst it does have the ability to remote view your baby or child, an adult should always be in the same house with the baby or child in safe conditions. The EyeOn Baby Camera is not a replacement for responsible adult supervision and you should still check on your baby or child regularly. Adhering to these baby camera safety tips will help you to ensure your child stays safe and you can effectively enjoy the best use of your EyeOn Baby Camera. How to ensure your EyeOn Baby Camera is secure. The first step is to make sure you turn on security features during the installation process. Follow the instructions, and make sure you set up a strong password at least eight characters long with a mix of symbols and upper and lower case letters. Make sure you keep the EyeOn Baby Camera software and mydlink Baby app is up-to-date. Cleaning your EyeOn Baby Camera. Clean the camera with a dry cloth only; do not allow the camera to get wet. The sticky pad on the desktop base may be cleaned with water and air dried(do not use a cloth to dry it); make sure the base is completely dry before using it with the camera again.